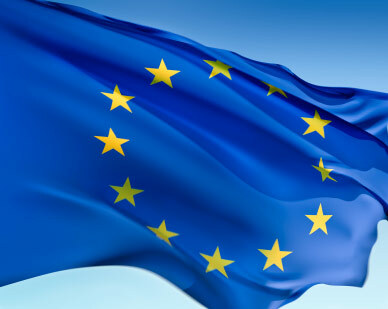 The annual essay contest is one way the EU Center promotes learning and curriculum building on the European Union in Illinois secondary schools. Another program is the annual summer study tour to Europe for educators, university students, and faculty and staff from the ten U.S. EU Centers of Excellence (EUCE), organized by the UNC-Chapel Hill EUCE on behalf of the Network of EUCEs. The European Union’s EUCE grant funds the study tour and the anticipated trip dates this year are June 15-21, 2013. One spot on the study tour is reserved for the teacher of the first place student from the Illinois EU Center essay contest. First place: Chris Lanza, Jr., Bartlett High School, for his essay The EU: Balance or Bust. 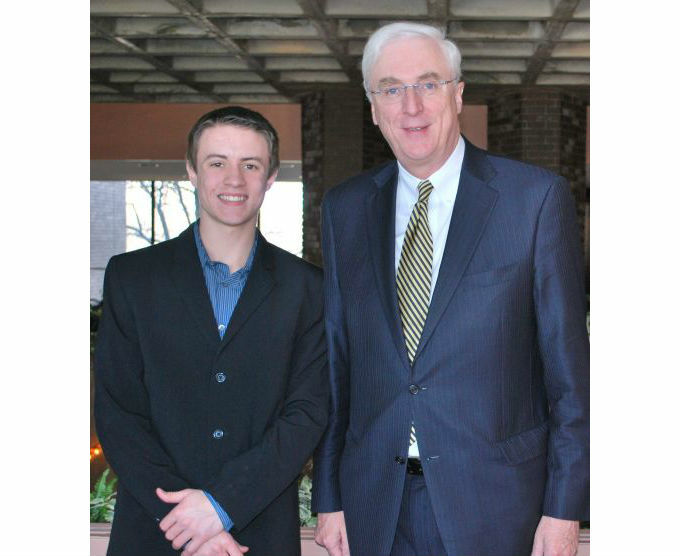 Chris earned a $200 cash prize and his teacher, Larry Pahl, will participate in a study tour to Europe this summer. Second place: Abigail Johnson, Oakwood High School, for her essay Collaboration for the Future: A Brief Look into Fusion Energy. Abigail earned a $100 cash prize. Third place: Shruti Africawala, Elgin High School, for her essay A Binding Spark. Shruti earned a $50 cash prize. The winning essays can be found on the EU Center’s website at http://www.euc.illinois.edu/essaycontest2012.html. The winning students, their families and teachers were invited to the EU Center’s EU Day Luncheon on February 15, 2013. The essay contest winners were recognized during an awards ceremony at the luncheon. The annual EU Day is the EU Center’s signature event. 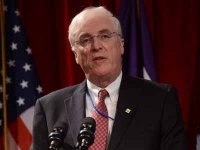 His Excellency Michael Collins, Ambassador of Ireland to the United States, delivered this year’s keynote “State of the European Union” address. 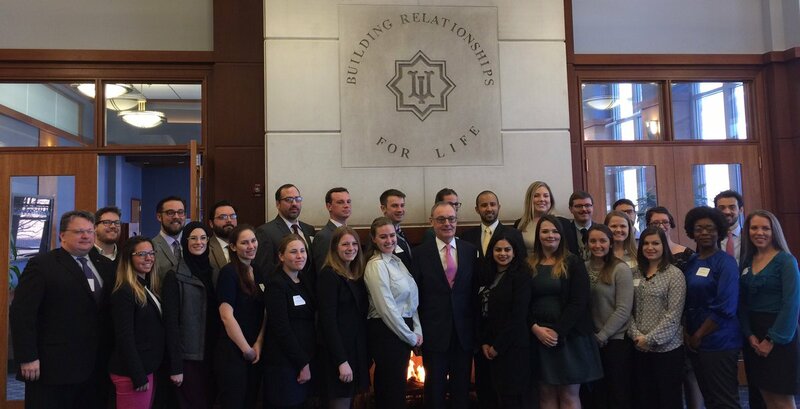 Other distinguished guests included Consuls General and representatives from several European consulates in Chicago, and legislators from the Illinois State Senate and House of Representatives. 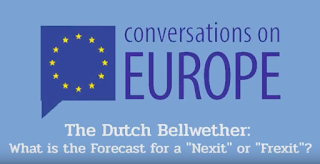 The EU Center is always looking to connect with more K-12 schools and educators and the Center invites all interested schools and students to participate in future events. Please check the EU Center website http://www.euc.illinois.edu this coming fall for details on the 2013 Essay Contest, and visit our website for various other opportunities for K-12 educators and students. 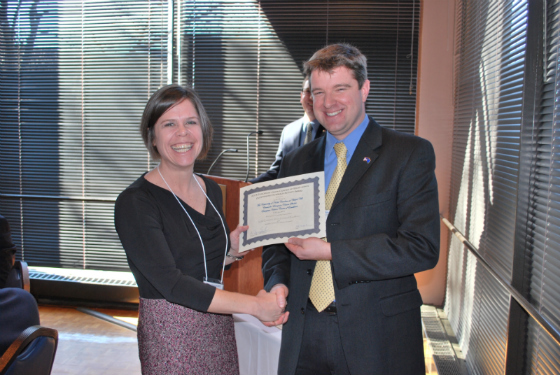 Erica Edwards, Executive Director of the Center of European Studies at the University of North Carolina at Chapel Hill, accepted the EUCE Outreach Activity Award in a ceremony as part of the 12th Annual EU Day at the University of Illinois on February 15, 2013. CHAMPAIGN—The European Union Center at the University of Illinois is pleased to announce that the Center for European Studies at the University of North Carolina at Chapel Hill has been awarded the European Union Centers of Excellence (EUCE) Outstanding Outreach Activity Award for their activity, Transatlantic Masters Program Partnership with Global Webfriends. The Program was led by the Center’s Executive Director Erica Edwards, Outreach Coordinator Anna Brigevich, and TAM Associate Director Sarah Hutchison. The EUCE Outstanding Outreach Activity Award was initiated by EU Center staff at Illinois to increase the awareness of excellent outreach projects conducted by the ten EU Centers of Excellence located throughout the United States. The review committee—comprising representatives from the Irish Embassy (His Excellency Michael Collins, Ambassador of Ireland to the United States), the French Consulate in Chicago (Consul General Graham Paul), and the Delegation of the European Union to the United States—acknowledged the success of UNC’s submission for the award. UNC’s EUCE, along with the submitted activities of eight other centers, will be featured in promotional materials to be distributed domestically and throughout the European Union in an effort to promote EUCEs in the United States. For the second year running, the Center for European Studies has teamed up with UNC's World View to link TransAtlantic Masters (TAM) students at Carolina with a program called Global Webfriends. TAM students are recruited to serve as overseas liaisons to elementary, middle and high schoolers throughout North Carolina. Each TAM student who takes part in the program maintains contact with a specific classroom while studying overseas in the UK, Czech Republic, Spain, France, The Netherlands, Italy, and/or Germany. Over the course of several months, the TAMbassador communicates with the designated classroom via Skype and other communication avenues and answers questions about the foreign country in which he or she is studying. Public school teachers and students throughout North Carolina have embraced the program with great enthusiasm, and interest among the TAM students remains high. On November 16th, 2012, Alexandria Faulkenbury and Katharine Robinson of World View conducted a Webfriends information session for TAM students and a number of them volunteered to share their future overseas-study experiences next semester. Last year, when the program was launched, several TAM students participated with two North Carolina classrooms. Established in 1998 as the result of a first-of-its-kind national competition, UNC’s EUCE has successfully received renewal with each subsequent national competition. The Center is led by Director, Lenski Professor of Political Science and Sociology, John D. Stephens. Ten U.S. institutions of higher learning were designated as Centers of Excellence in 2011 and will receive funding support through 2014. The European Commission funds the EUCE initiative as part of a broader effort to promote people-to-people ties across the Atlantic. CHAMPAIGN – The European Union Center at the University of Illinois is pleased to announce that Professor George Ross is the 2012 recipient of the Larry Neal Prize for Excellence in EU Scholarship, for his book The European Union and its Crises: Through the Eyes of the Brussels Elite, published by Palgrave Macmillan. The Larry Neal Prize was initiated by the EU Center at Illinois to recognize excellent research conducted by affiliated faculty of the EU Centers of Excellence located throughout the United States and Canada. 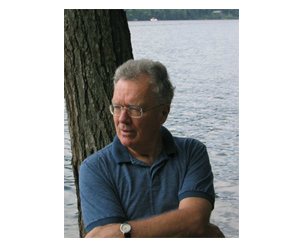 Dr. Ross is an Adjunct Professor of Political Science and ad personam Jean Monnet Chair at the University of Montreal. He holds a Ph.D. in Government from Harvard University. As part of his award, the EU Center has invited Professor Ross to give a public lecture at the University of Illinois on his award-winning book. The lecture will take place in Fall 2013. In honor of Professor Emeritus of Economics Larry Neal, the founding director of the European Union Center at the University of Illinois, the EU Center created the “Larry Neal Prize for Excellence in EU Scholarship” through the generous funds from the European Commission’s European Union Center of Excellence grant. Each year the Center solicits submissions of both books and articles that address current issues faced by the European Union and in EU-US relations. Submissions are encouraged from all disciplinary fields. Visit the University of Illinois EU Center web site for more information about the award submission procedures and a list of previous winners. There is a good chance that a person with limited awareness and knowledge of the European Union (EU) would still be able to connect Greece with the “Euro Crisis”. While there could be several reasons for this, one very probable reason is that this issue has received a significant amount of media attention over the last few years. While the debt crisis is definitely a legitimate concern, there is another crisis which is currently not only spreading through the EU, but also shooting down healthy roots. While the conference encompassed a variety of topics, Professor Sinno’s sobering keynote address was clear: being a minority in the EU is a difficult road, particularly for Middle Eastern minority groups. 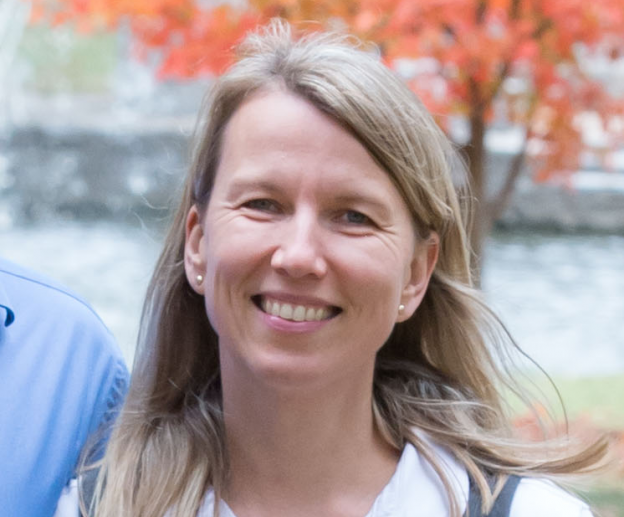 Dr. Sinno’s lecture could lead to a lively debate regarding EU anti-discrimination policy, however it would be much more profitable to connect it with two broader issues, that of EU identity and integration. Scholars of the EU have already highlighted the tension between member state sovereignty and integration. It is generally accepted that most EU citizens still identify primarily with their own nation, which poses a challenge for policy-makers and EU leadership interested in building a common EU citizen identity. It is logical that the Euro Crisis has been on “center stage”, yet it would be interesting to know (hypothetically speaking) how much money is spent addressing the effects of discrimination, such as unemployment and criminal justice related issues. To take this one step further, it would be fascinating to compare this figure with the debt crisis figures, ideally resulting in a better picture of exactly what kind of a financial crisis the EU is facing. Regardless, it is clear that the EU is in need of strategies, which will help its citizens enjoy “being together” and not simply “doing together”. 5For more information, please see: http://www.enar-eu.org/. "More crowds on Brick Lane," © bongo vongo, used under a Creative Commons Attribution-Share Alike 2.0 Generic license. Retrieved 2/20/13 from http://upload.wikimedia.org/wikipedia/commons/8/83/Mela_crowds.JPG. 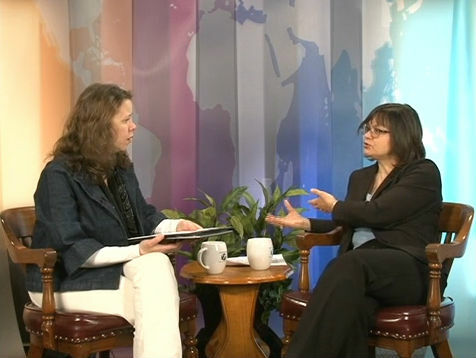 ECU affiliated faculty member Zsuzsa Gille joins moderator Nicole Tami on Illinois International to discuss the topic of the March 1-2 Joint Area Studies Symposium, "The Future of Waste." The symposium is co-sponsored by the European Union Center, along with other Title VI International Area Study Centers. You may watch the full interview below or by clicking here. Visit the Joint Area Studies Symposium webpage for more information about the symposium, including its full schedule. On February 12, as part of the Twelfth Annual EU Day events, Irish Ambassador to the United States Michael Collins took part in an interview with Focus, a radio interview program on Champaign-Urbana's NPR station, WILL-AM 580. The Ambassador discussed topics ranging from the country's debt problems, Ireland’s presidency, the role the EU is taking in turmoil in Syria, and how he manages Ireland's relations with the United States. To listen to this interview, click here or visit its Focus page. 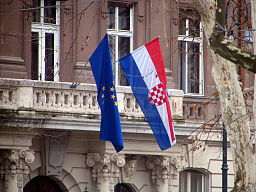 On January 22, the University of Illinois joined students and faculty at University of North Carolina, Chapel-Hill, University of Washington, the University of California at Berkeley, and the University of Pittsburgh in a videoconference on Croatia’s impending accession as the 28th member state of the European Union. 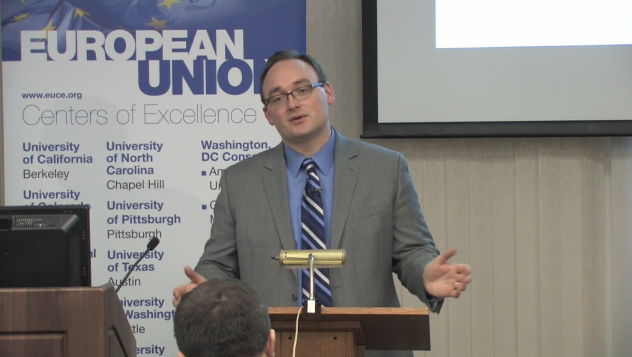 The videoconference was an installment of "Conversations on Europe," a series of interactive virtual roundtables for 2012-13, co-hosted by the European Union Center and coordinated by the European Union Center of Excellence and the Center for Russian and East European Studies (REES) at the University of Pittsburgh. 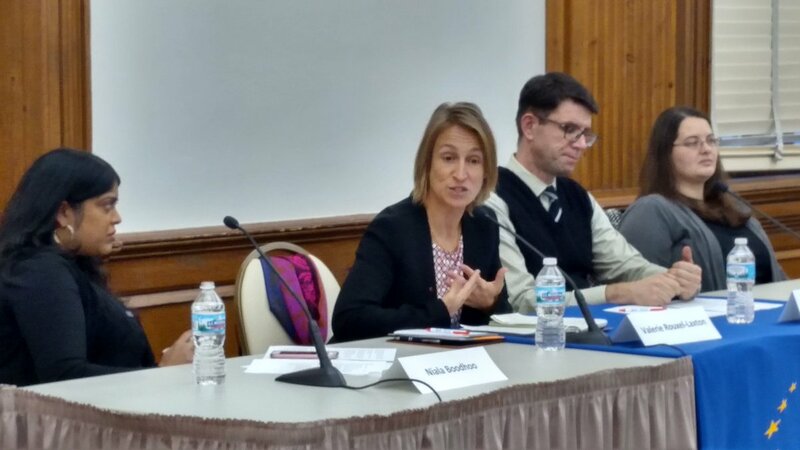 In "The Next Member State: Croatia's Path to the European Union," experts throughout the U.S. discussed the Europeanization process in the western Balkans, the impact on Croatia (and on the EU) of enlargement, and related topics. The speakers included REES Center Director Robert Hayden, Professor Natasa Besirevic, a faculty member of the Political Science Department at the University of Zagreb, Dr. Laura Hastings, Political Science lecturer and Interim Director of the Global Studies degree major at the University of Illinois at Urbana-Champaign, and Dominik Tolksdorf, TAPIR Fellow, Center for Transatlantic Relations, Paul H. Nitze School of Advanced International Studies at Johns Hopkins University. The panel was moderated by Dr. Andrew Konitzer, Associate Director of REES. View the roundtable discussion below or by clicking here. 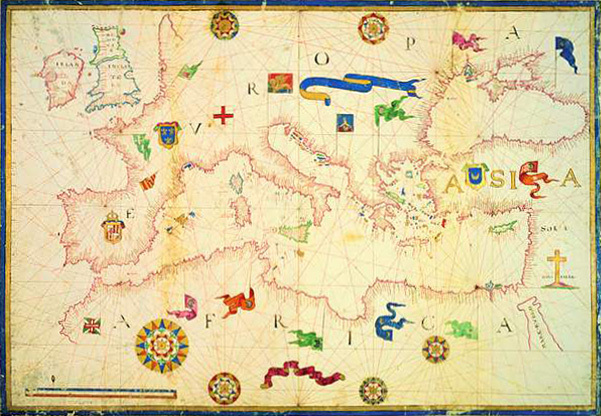 Geographically, the Mediterranean has always been a backdrop for cross-cultural contact, between East and West, and between North and South. Thanks to its multicultural character, it has been perceived in many ways: as a unified and exotic space, a space where the ideals of coexistence somehow become possible, or contrastingly as an isolated space of prolonged conflict. Yet, the complexity of cultural contact in the Mediterranean and its political and social consequences cannot be left to broad generalizations. Its united image must be scrutinized, and its cultural "mixture" across various boundaries needs to be looked at more closely. The upcoming Mediterranean Studies graduate student conference entitled “Real & Imaginary Borders Across the Mediterranean” is an interdepartmental event aimed at provoking such scholarly discussion about this region. With the support of the School of Literatures, Cultures & Linguistics, the conference will focus on the risk of crossing borders – whether national, political, psychological, or cultural – within the Mediterranean and will showcase the work of graduate students from UIUC and abroad. This two-day event will take place in the Lucy Ellis Lounge, in the Foreign Language Building, on February 8th and 9th, 2013. "Real & Imaginary Borders Across the Mediterranean" will host two distinguished keynote speakers: Professors Ruth Ben-Ghiat from New York University and Abdulkader Sinno from Indiana University Bloomington. Relating to her upcoming publication on empire cinema produced in Fascist Italy, Professor Ben-Ghiat will speak about how the production and reception of these films relates to Mediterranean crossings. Professor Abdulkader Sinno's talk, “Political Dynamics and Population Movements Across the Mediterranean," will shed insight on his recent research in political experiences of Muslim minorities in Europe and on relevant research methods in political science and Mediterranean studies. These two enlightening talks, along with panels showcasing some of UIUC's graduate student research, should attract students across schools and disciplines. For more information about the conference schedule, please visit us at http://publish.illinois.edu/mediterraneanconf/.